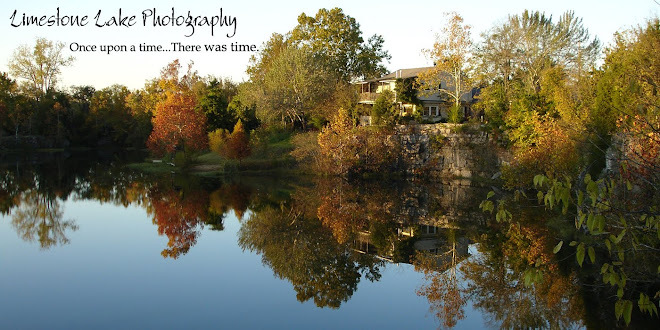 Limestone Lake Photography: A little History! Limestone Lake Photography passed a milestone yesterday, celebrating it's 20th anniversary! Of course Limestone Lake has been here probably for at least a century when the first Limestone rock was blasted out of the ground, as it was pretty close to the surface. Back then they used dynamite and used steam drills to bore the holes to put the dynamite in, they would have a crew drilling the holes during the day while other workers hauled out the stone which had been blasted at the end of the day when all work had ceased and the workers had left. Some of the unblasted holes can be found here in different areas! It was dangerous work and you had to be very careful in handling the explosives which contained nitroglycerin. I have wondered at times how many sticks of dynamite was used to create this 7 acre lake which is 35 feet deep in places. I'm sure people who happened to live in houses near here could hear and feel these frequent explosions. I'm sure if they had had OSHA or the EPA back then this lake would not have been here! Eventually, in the southwest corner of this quarry, one of the last blastings opened up a branch of the Lost River system tributary causing the water to fill up and cease the operation of this working productive quarry which caused most of the workers here to seek other employment. It has been said the equipment used in the process of getting the blasted rock out is possibly still on the bottom today. Pumping operations were unsuccessful in draining this lake which remains at a constant level today due to a channels in the underground caves system. A Mr. Price owned this quarry, I am uncertain if he was the original owner who started this operation, but when it was no longer productive, he donated the land here to a local church. Rufus and Pat Grider bought the land, 25 acres here from the trustees of that church. It was not a pretty place with little vegetation and large stones all around. The Griders had the foresight to see that this place could be turned into a paradise and built a stone house with hardwood floors and knotty pine inner walls. They loved this place and spent much time developing it into what they had dreamed it could be. Mr. Grider had the city, dump leaves they collected and used them to mulch a rich garden where he grew some of the largest tomatoes in the city, back when alot of people raised their own vegetables in their back yard gardens! When Mr. Grider died, Mrs. Grider lived here alone till she could no longer take care of herself after falling and breaking her hip. This place was later sold at auction, whose buyer did not live here, it was rented for a time as it slowly went back to nature. I was living in the Cincinnati, Ohio area at the time when I saw an advertisement in the real estate section of The Daily News paper my son brought back when he had attended WKU. It was a ReMax ad by Martina Neely an agent there. Everything that was meant to be was and I've been here ever since and never want to leave. People ask me how I found this place and I always reply,"I didn't find it, It found me!"